Through his idiosyncratic mode of picture making, Benjamin Butler addresses the tension between pictorial beauty and conceptualism that has long overstayed its welcome in art discourse. He has done so by almost exclusively painting tree motifs for the past fifteen years. 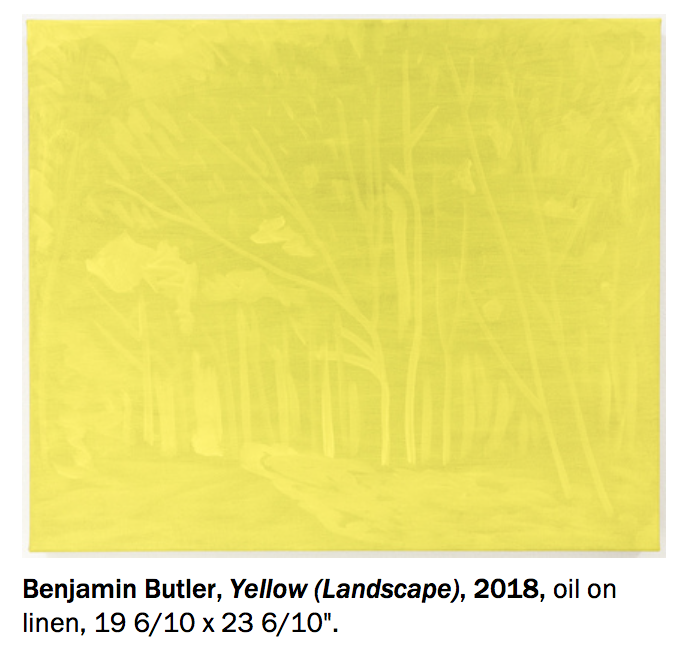 Solitary trees, trees in groups, trees in a rudimentary landscape: One could say that Butler has been painting the same view over and over, zooming in and out to explore permutations of form, composition, and color. In its seriality and almost absurd persistence, Butler’s practice is in the lineage of conceptual repetition that originated with Cézanne and includes Sol LeWitt and Hanne Darboven. However, his painterly language is also clearly indebted to the tradition of the picturesque, with all its lyricism, prettiness, and corniness that made the genre anathema to both modernists and historical Conceptualists. In other words, Butler’s works are an impure hybrid of opposed aesthetic and intellectual traditions, mutations that evade easy categorization. Such fertile hybridity is showcased most clearly in the series “Monochromes,” 2018. In each of these medium-size canvases painted with a single color, one sees faint traces of scenery with—naturally—prominent trees. Again, repetition is the key. The modernist trope of monochrome is juxtaposed with the most familiar of motifs and produced through the rigorous methodology of minimalism. The undeniable beauty of the artist’s individual paintings camouflages the contradiction that lurks within. Yet what ultimately emerges is a singular kind of visual resolution.